Mission: War is everywhere! Your goal is to conquer the front lines of the enemy and to complete your assignments in enemy territories at any price. World War II is fully underway. A small elite troop of Allies has been sent over the front line to breach the enemy resistance. You have this once in a lifetime chance to assist in the many operations of the unit! You'll take part in a foray through the deserts of Africa, fight against the enemy in the narrow alleys of European cities and find and destroy a secret missile base in the Palatinate Forest. Choose to play different main characters and different weapons! 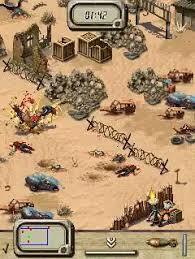 Carry out dangerous missions in remote enemy regions and defeat them! Download Force Recon (Ru) 2009 game for mobiles - one of the best Java games! At PHONEKY Free Java Games Market, you can download mobile games for any phone absolutely free of charge. Nice graphics and addictive gameplay will keep you entertained for a very long time. At PHONEKY, you will find many other games and apps of different genres, from adventure and action to the logic and racing Java jar games. To see the Top 10 best Java games for mobiles, just sort games by popularity.